Sponsors of Glenwood’s Christmas Season Holiday Food Drive have again mobilized to ensure that every school family has a Merry Christmas and a Happy New Year! 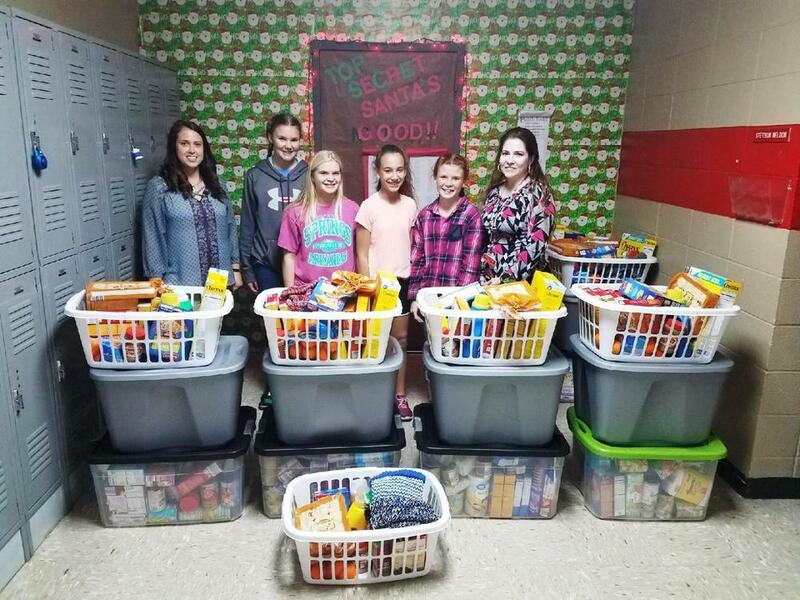 Glenwood’s Booster Club, local churches (Hilltop Chapel and China Union), students, parents and school personnel have donated canned goods, gifts, hams and turkeys as well as all the “fixins” for some great year-end eating! 13 large baskets of food are being distributed to families that can use them! A great big Glenwood Thank You to everyone who helped out this year! 8th grade was the winner of the ice cream party for the class that contributed the most items. Pictured left to right are school Counselor, Mariah Hayes, Adrianne Gastineau, Abby Ford, Diana Kaufman, Alexis McGhee, and middle school language arts teacher, Michelle Finley.